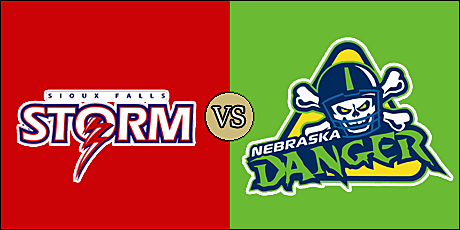 GRAND ISLAND, NE - The Sioux Falls Storm scored the last 17 points of the first half and held off the Nebraska Danger in the second half en route to their second win of the Indoor Football League season tonight at Eilhusen Arena. The win lifts the Storm to 2-0 on the young season, while the Danger fall to 1-2. The teams will meet one more time this season; May 18 at Sioux Falls. Sioux Falls got things going early, scoring on their first drive on Lorenzo Brown's 16-yard pass to Damian Ford. Nebraska scored on a pair of touchdown runs by quarterback Tommy Armstrong, Jr. (two and one yards, respectively) to go up 13-7. Darrian Miller's one-yard run gave the Storm a 14-13 lead with 1:44 left in the opening quarter. That would stand heading into the second. The Danger retook the lead, 16-14 on Jarod Haynes' 47-yard field goal with 10:35 remaining in the second quarter. The Storm came right back, with Brown rushing in from a yard out midway through the quarter. They added to that with a 54-yard field goal by Bergner with nine seconds remaining in the quarter. Nebraska attempted a long field goal, but it was blocked and recovered by Storm defensive lineman Claude Davis as the clock expired. Sioux Falls led 31-16 at intermission. Armstrong's nine-yard run pulled the Danger to within 31-22 with 11:34 to go in the third quarter. Lorenzo Brown, Jr. found Damian Ford on a 34-yard touchdown pass and the Storm had a 38-22 lead which lasted through the end of the third quarter. Brown opened up the fourth quarter with a one-yard run. Bergner hit from 33 yards to put Sioux Falls up 48-30 with 8:13 remaining. The Danger cut into the lead on Armstrong's 14-yard pass to Gregory Dent, Jr. Davonte Sapp-Lynch's two-point conversion run was successful and the Storm lead was cut to 48-30. Brown wasn't finished, however. He scampered for 14 yards to give Sioux Falls a 55-30 lead at the one-minute warning. The Danger added a two-yard run from Armstrong with 10 seconds remaining which cut the final deficit to 19 points. The Storm more than doubled the Danger in total offense, 245 yards to 120, including a 170 yards to 75 edge in passing. Sioux Falls were flagged 11 times for 65 yards, while the Danger were penalized six times for 61 yards. Each team forced and recovered a fumble. Brown finished 13 or 18 for 170 yards with two touchdown tosses, along with three rushing touchdowns. Miller rushed six times for 33 yards with a visit to the end zone, and caught five pases for 23 yards. Ford hauled in four balls for 77 yards with two scores, while Brandon Sheperd had three catches for 59 yards. Matt McKoy led the Storm defense with 5.5 total tackles and a fumble recovery, and Kanyia Anderson had a sack and two tackles for loss. Armstrong went 11 of 17 for 89 yards and a touchdown, and rushed 11 times for 29 yards and four scores. Dent finished with five receptions for 34 yards and a touchdown grab. Steffon Herd paced the Danger defense with 8.5 total tackles, while La'More Wise recovered a Storm fumble. This was kind of a blowout from the second quarter on. Nebraska didn't seem to have much of a chance. Sioux falls just proved to be too much. They most often just find ways to pull out games.